Dogs are one of the biggest winners of Britain’s holiday park boom with many more pooches now enjoying holidays, as part of the family, rather than being left at home in kennels. Park Holidays UK, for instance, confirms it welcomed more than 5,200 dogs in 2017, and is on target for even bigger figures this year. 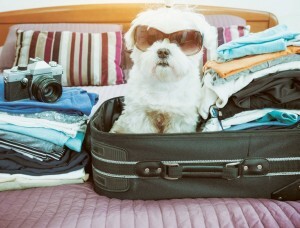 Overall, it says, guests bringing pets have risen by over 60% in the past three years. Now the group, which boasts 26 seaside holiday parks in southern England, has also decided that Rex will no longer have to ‘ruff’ it in budget Bronze accommodation. This year, the doors of selected Silver and Gold standard holiday homes are being fl ung open so that owners and their pets can enjoy their stay in style Park Holidays UK director Tony Clish said the move is designed to provide a wider choice for the growing number of people who are now opting for a UK holiday: “Staycations might be providing a big boost to Britain’s tourism economy, but it’s the nation’s dogs which have the biggest smiles on their faces,” he said. “Many families tell us they hated being separated from their pets when they went abroad, and felt guilty that their four-legged friends weren’t with them. “Our holiday parks are also a great place to exercise a dog on a lead as the grounds are virtually traffic-free, and all have nearby countryside and coastal footpaths. “Dogs benefit as much as humans from a change of scenery, and owners won’t be fretting that their pets are pining for them in expensive boarding kennels far away,” added Tony. Holiday Resort Unity also offers a range of pet-friendly accommodation which equates to 15% of its total fl eet, as well as accepting pets on touring and camping fields. Last year, HRU say 9,432 dogs stayed with them. The company also allows holiday home owners to fence in their own gardens and this is a big draw when a dog-owning customer is looking to purchase a holiday home, so having a dog friendly venue is really important for the business. “Our location is a draw for customers with pets as we are a short walk from the sandy beaches of Berrow and Brean which stretches for nearly fi ve miles and from the other side of the park there are numerous footpaths that head out into the country side,” says Director Alan House. “We also have a designated dog walk area on the park which is very popular with guests and owners,” Alan adds. “With our pet friendly units, on our hiring fl eet, we have switched out carpets and replaced them with vinyl floor coverings to help with cleaning and we also have a number of units with fenced gardens.” With a new stretch of the England Coast Path just opened alongside Brean Leisure Park, an increase in the number of dog walkers would be inevitable. All pet owners would be welcome, said Alan, whether staying on the holiday park or not. 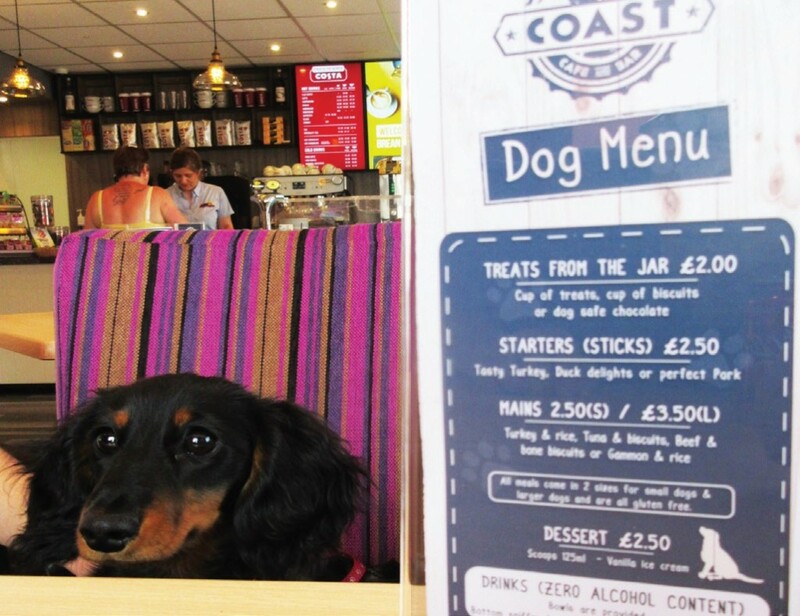 Backing their pet-friendly mission, HRU’s Brean Somerset holiday park recently opened a new café, called Coast, which is welcoming both humans and hounds. HRU is putting pooches on a pedestal by offering them their own food and drinks menu when they visit with their owners. Alfie and Poppy’s special menu includes starters, main courses and desserts – plus, of course, a selection of drinks such as Pawsecco and Bottom Sniffer Beer, both made for dogs. Instead of being forced to lie on a hard floor, Tysons, Milos and Max’s will have their creature comforts provided for by a soft blanket on which to recline. “We listen very carefully to our customers all the time, and their feedback on this issue was that they didn’t want their four-legged friends separated from the family at meal-times,” says Alan. “So when we created Coast, we decided to go the extra mile and not only invite dogs in to the café, but to present them with their own three-course menu to chew over. “Now we have solved everyone’s doggy dilemma at a stroke, and customer reaction has been brilliant!” he adds. Park Leisure, know that many of its owners see their pets as another member of the family, and there’s nothing worse than the prospect of having to leave your four-legged friend behind whilst you head off to make memories. That’s why every single one of their 12 parks are pet friendly, creating the perfect luxury home-from-home experience. Beautifully located across the UK in stunning country and coastal settings, many of our parks are perfectly placed just minutes away from spectacular dog-friendly beaches, pubs, and picturesque walking trails, creating an idyllic base for a getaway for the whole family. Home owners can obtain information about nearby dog-friendly destinations by popping into their owner’s lounge. Approximately 50% of Park Leisure holiday home owners have dogs, and feedback demonstrates that the parks’ dog friendly facilities have been a real attraction when prospective customers are making a purchasing decision. Park Leisure ensures all facilities accommodate pets and their owners, with the following facilities currently available to dog owners: • Exclusive dog walking areas, offering a safe place for dogs to play freely • Disposal bins situated throughout the parks for easy dog-waste disposal • Designated drinking areas for dogs • An array of walking paths and routes to choose from, ranging from long adventurous walks to relaxing strolls • On-park convenience store offering dog related products Just recently, Malvern View Country & Leisure Park has added a custom-built, five-star treat and water station for the abundance of dogs on-site – one of Park Leisure’s most popular destinations for animal lovers, a whopping 60% at Malvern View are pet owners. For those who want to dine with their four-legged friends in tow, both Brynteg and Plas Coch Coastal and Country Retreats offer dog friendly restaurant and bar options. We hope you get the message. Holiday parks need to not just be Fido-friendly but specifically cater for our canine customers. For there is no doubting the pulling power of pooches when it comes to attracting and retaining a special breed of customer. Those who fail to heed the doggy command are truly missing out. Whitehill Country Park in South Devon has set tails wagging with the launch of extra dog-friendly features for four-legged guests. Further fanning the Paignton Park’s pooch appeal are new ‘dogs welcome’ caravans, including a boutique range for hounds looking to holiday in style. Better still, the family-run holiday park has also introduced a warm doggy shower which offers Fido a nose-to-tail makeover after a muddy walk. 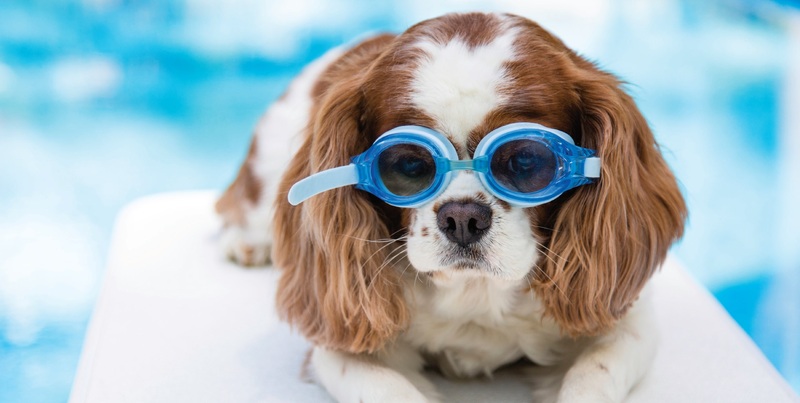 The new sprinkle-spa is one of many dog-friendly facilities found at the park with its dedicated pet exercise area and complimentary doggy bags available to owners. Whitehill Country Park marketing director Claire Jeavons says there has been a steady rise in demand for dog-friendly accommodation over recent years: “It’s estimated that around twelve million households in the UK own pets, including over eight million dogs of all shapes and sizes. “Dogs are always regarded as very much part of the family, and our aim at Whitehill is to make them feel just as welcome as their human counterparts by introducing more dog-friendly caravans, and features such as our new doggy showers.” The wide range of dog-friendly accommodation includes caravan holiday homes, luxury lodges, and touring and camping pitches. In addition, all guests holidaying with dogs are given a Whitehill Doggy Information Guide on arrival which highlights delightful dog-friendly walks and attractions found in Devon. Family-run Beverley Holidays in Paignton set tails wagging with a Bring Your Dog To Work Day. Staff were joined in the workplace by their canine companions to support two top animal welfare charities as part of a nationwide initiative of which Beverley is an offi cial sponsor. Highlights of the day included a Crufts-inspired parade of pooches, a series of challenges to fi nd which pets had the Rex-factor, and a ‘Beverley’s Best in Show’ fi nale. 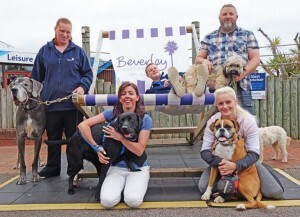 The fundraising initiative coincides with news that the group has opened its doors to man’s best friend with a range of dog-friendly holiday caravans and facilities on Beverley Bay for 2017. Pet owners can now choose from a range of holiday caravans kitted-out for hounds who like to holiday in style, coupled with a dedicated dog exercise area. Its warm doggy shower is also proving a ‘pooch-tastic’ hit, providing dogs with privacy while they clean their muddy paws, plus an ‘A-la-bark’ menu, and Beverley Doggy Holiday Guide for guests. Beverley Holidays director Claire Jeavons, said: “Dogs are very much part of the family, and our aim at Beverley is to make them feel just as welcome as their human counterparts. “Our introduction of our dog-friendly caravans and facilities for 2017 is already proving very popular among owners and dogs alike,” she added.